I was looking for the hidden message in this picture sent to me yesterday. I like pizza. I like oysters. I like beer. 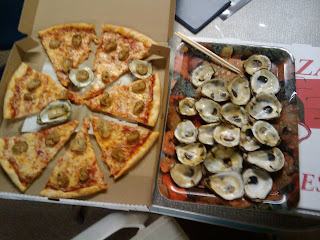 (turtles, not so much) Looking at the oyster shell formations, the arrangement of the pizza slices. Maybe there was no hidden message afterall. Just a brewer's attempt at getting my attention. Got my attention, now where's my lunch? Dad always said there was no such thing as a free lunch. This Casey Hughes guy sure knows how to use this new-fangled media. Twitter, e-mail, Facebook, company website. All seem to point to a new Flying Fish Exit 1 beer (an oyster stout) debuting in November. I think we're gonna have fun with this one. Looks the brewery already is.